Well, after much planning and special arrangements, the surviving six A4's were displayed at York Railway Museum yesterday. 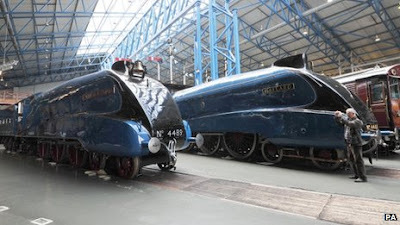 It is the first time the six engines have appeared together - Dwight D Eisenhower, Mallard, Bittern, Union of South Africa, Dominion of Canada and Sir Nigel Gresley are now in place around the turntable and have been seen by large crowds. Three of the engines are operational - Sir Nigel Gresley, Union of South Africa and Bittern. Two of the engines, Dwight D Eisenhower and Dominion of Canada have been shipped from North America for the event. They have been gathered in York in a "major celebration" to mark the 75th anniversary of a world speed record when, Mallard achieved a record speed of 126mph. Gathering the engines was a huge undertaking, organisers said. Anthony Coulls, the museum's senior curator of rail vehicle collections, said: "What we're planning is a major celebration - people will be coming from four corners of the earth." Mallard still has golden plaque on its side that reads: "On July 3 1938 this locomotive attained a world speed record for steam traction of 126 miles per hour." Mr Coulls said: "Mallard's record was the pinnacle of steam and it was the swansong." British Rail's 1955 modernisation plan began sweeping steam away, Mallard was withdrawn from service in 1963. The six engines will be on display until 17th July and admission to see them is free. If anyone manages to make a visit to York whilst the A4's are on display, please send us pictures for possible display on this website!